There are many variations to this recipe but for a quick and healthy dessert/snack, this can be whipped up in minutes. Laura, who works with us at the clinic brought them into work the other day and I couldn’t help but make them the next day. Place the nuts in a food processor and break them down into chunks. Add the dates in pieces and vanilla. Process until the nuts and dates form a batter together. Taste the batter, if you desire additional sweet flavour add maple syrup. OPTION: You can also add a couple tablespoons of ground flax seeds for added nutrients and fiber. Grab a handful of batter and test the consistency by rolling into a ball, make sure it holds together. If it is not sticky enough, add a few more pitted dates or maple syrup and process until they hold together. Once your batter is ready, roll into balls (approximately 1 inch in diameter) and store in the fridge so they become firm. 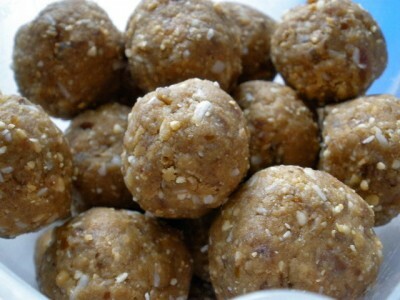 This will make approximately 24 balls that are an easy and healthy grab on the go snack! *Can also be frozen and taken out when needed.